10th Floor, 16, Sansad Marg, New Delhi. Eligibility-Three years Diploma with minimum 60% marks in Electronics or Electrical or Information Technology or Information Technology or Computer Science or Instrumentation or any combination of disciplines where Electronics is the main discipline, like Electronics & Telecommunication OR B.Sc. (with Physics/Chemistry/Computer Science/Maths/ IT/Electronics) or Bachelor of Computer Application or Master of Computer Application. Experience- 3 years post-qualification experience required for these posts. Crucial date for determining eligibility-01.07.2015. Mode of selection-written test, interview and medical examination. Resignation-Three months advance notice shall be required. Admit Card/Call Letters for interview shall be sent through e-mail only. Application Fee-Demand draft of Rs. 300/- (Rs. 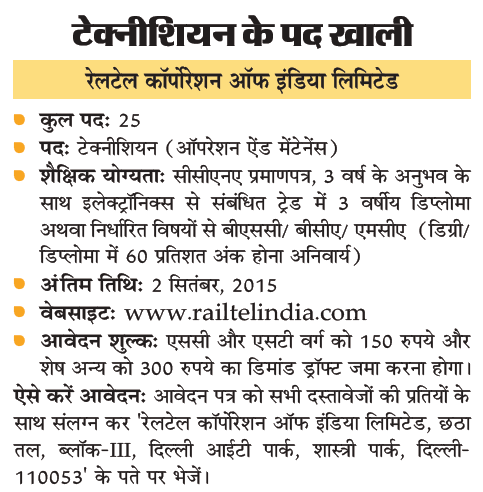 150/- for SC/ST) drawn in favour of ‘RailTel Corporation of India Limited’ payable at Delhi. No traveling expenses will be paid.